Yesterday was my 50th birthday, and it was wonderful. So far I don't feel much older than I felt at age 49. But I haven't had anyone say, "How old are you?" yet. We'll see how it goes. I did have one particular moment of excitement yesterday. I had gone out to run some errands, and when I came home, a FedEx delivery truck was in my driveway. My heart skipped a beat with excitement. A package! Delivered right on my birthday! Aha. Flushable wipes and toilet paper. Welcome to your 50's, Richella! 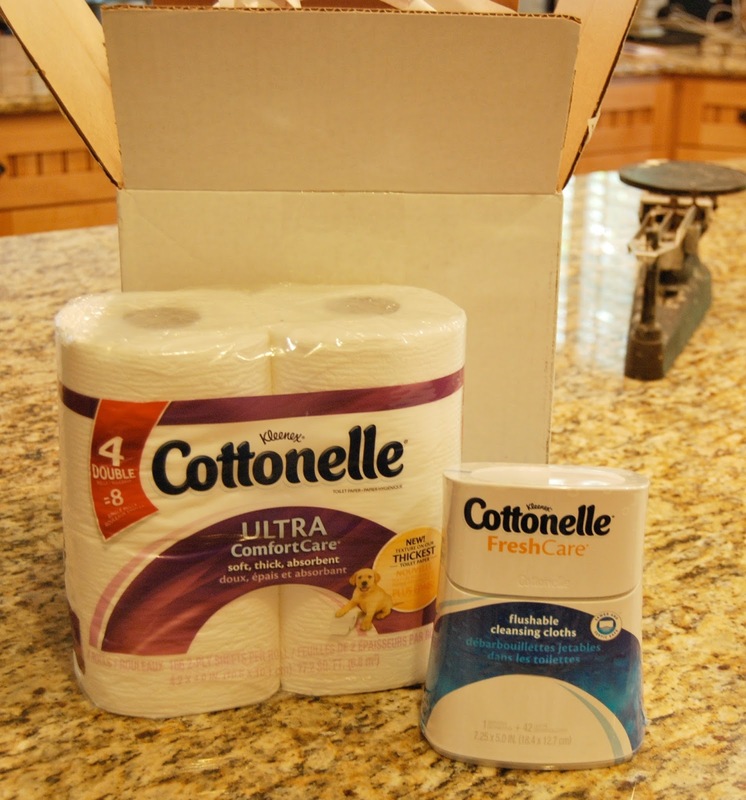 Turns out that the package was from the kind folks at Cottonelle, one of the sponsors of this year's Haven Conference. I'm guessing lots of Haven Conference attendees got this same package yesterday, but I'll bet that no one else received it on her 50th birthday! Anyway, it was generous of the team at Cottonelle to send this out, and I thank them. My friend Sonya said, "At least it wasn't Depends." True enough. Entry #165, Kristin S! Kristin, I sent you an email! Do you run giveaways, too?Try Rafflecopter! It's free. Do you advertise? Promote your brand w/ Rafflecopter. **What's the funniest present you've ever received? Congrats to the winner! How funny that you got that package on your birthday. Thank goodness it wasn't a box of Depends! Now that would not be a nice joke at all! I kept meaning to tell you happy birthday all day yeaterday...I think I even typed it somewhere but didn't have time to say what I wanted to say so I gave up. Lol! I hope your day was as beautiful as you are, sweet girl. As for the funniest present, one year I got emery boards for Christmas. So, I'm reading your post and laughing and thinking, "I know Sonya!" and then read about Kristin S. Oh, that fortunate Kristin S.
Wait, let's go check email... it's me!!! Thank you Richella! Kinda weird to thank you on your birthday. This made me laugh! Happy birthday! Aww Happy Birthday dear friend! You don't look a day over 30.